Centrally located on the island of Oahu, the West Oahu campus of the University of Hawaii is a commuter school that offers a variety of educational programs - from the liberal arts to select professional and pre-professional programs. Campus enrollment is small, which keeps the education personal. Describe the type of student who should not attend University of Hawaii-West Oahu and explain why. Describe the type of student who should attend University of Hawaii-West Oahu. Why? The type of student who is serious and dedicated about obtaining their college degree to pursue their dream profession. What is a typical University of Hawaii-West Oahu student like? Describe the type of person that should attend University of Hawaii-West Oahu. What are the top 3 reasons someone should attend University of Hawaii-West Oahu? The top three reasons someone should attend University of Hawaii - West Oahu are small class sizes, dedicated professors and campus life large enough to engage in without ever getting lost in the crowd! What was a typical University of Hawaii-West Oahu student like in high school? Describe the type of person that should attend University of Hawaii-West Oahu. 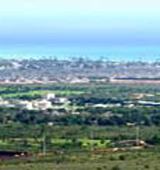 UH West O'ahu is a baccalaureate degree granting institution which offers degrees in the liberal arts and professional studies. As the only public four-year university located in the leeward O'ahu area, UH West O'ahu is committed to the continuing development of the region through both innovative educational offerings and public service activities. UH West O'ahu emphasizes quality teaching and flexible class schedules that foster life-long learning, thus enabling students to pursue career-related education coupled with the values, ideas, and challenges of the liberal arts. The academic program structure stresses the exploration of interdisciplinary studies, cross-cultural and international studies, and communication skills. Targeting the communities of west O'ahu and other underserved parts of the state, UH West O'ahu meets the educational needs of both recent high school graduates and non-traditional students. It provides innovative alternative learning opportunities such as instruction via computer and telecommunications, certificate programs, mentoring,individualized degree programs, and credit for prior learning. What are the top 3 things that students do for fun at University of Hawaii-West Oahu? I am a single parent who is employed full-time. Most of the things that I do for fun is spending quality time with my daughter. The average student pays $6,163 for tuition, fees, and other expenses, after grants and scholarships. Total stated tuition is $6,096, in-state and on-campus, before financial aid. Learn more about financial aid at http://westoahu.hawaii.edu/financial. Estimate the net price for you at http://westoahu.hawaii.edu/uhwo/finaid/npcalc/. Want more info about University of Hawaii-West Oahu? Get free advice from education experts and Noodle community members. Are there any electrician programs? Unfortunately, it doesn't appear that the University of Hawaii - West Oahu has any electrician training programs. You can find a list of degrees and certificates offered by the University in the "Academics" section of their website. Are there dorm rooms available for out of state students?